Who says men can't cook? This weekend I was excited to see a cooking demonstration by Martin Yan, of "Yan Can Cook," my first favorite television cooking show star. I grew up watching Martin Yan on PBS, my first exposure to Chinese cooking. I know many of you out there (Jenn, Erin, Whitney, just to name a quick few...) have men in your life that can cook/grill/smoke food like nobody's business. So again, who say's men can't cook? Not I, says the fly. Oh, and one last thing--this weekend I signed up for our third year with New Century CSA. Interested in a CSA? Check out LocalHarvest.org. Of all my emergency/go-to/pantry-dive dinners, pasta dishes are the undisputed champion. Why? All you have to do is boil up some pasta, conjure up a sauce and add whatever you have on hand and voila, you are a kitchen miracle worker, creating dinner out of (seemingly) thin air. But why reach for the marinara sauce when you can do something novel and use pureed pumpkin to create a quick and easy sauce? Yes, I wrote "pumpkin." 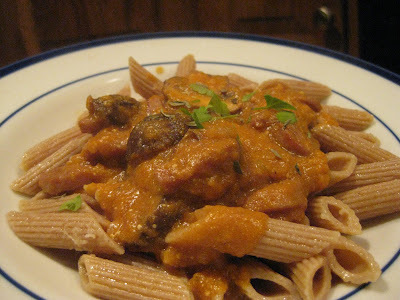 Pumpkin puree makes a really rich tasting and savory sauce for this pasta dish, which can be made with sausage, or vegetarian...both versions are quite tasty! In a stock pot, boil the pasta according to package instructions. Meanwhile, heat the olive oil over medium high heat in a large skillet. Add the mushrooms or sausage, onion and garlic. Sprinkle with salt, thyme, rosemary and pepper. Cook well, for about 6-8 minutes, or until the mushrooms begin to brown or sausage is fully cooked. In a medium bowl, combine the pumpkin and wine or broth. Stir well. Add to the skillet and mix to incorporate. Add the sour cream and stir well. Remove from heat. Place pasta in a serving bowl and cover with pumpkin sauce. Sprinkle with hot sauce and parsley, if desired. Have you tried Indian cuisine yet? A long time ago I was under the horribly mistaken assumption that a trip to an Indian restaurant would equal a trip to the CVS to pick up some Pepto. Wrong, plain wrong. If you want to try your hand at some really lovely Indian food but don't want to go too far out of your palate's comfort zone, here is a great place to start: Chicken Tikka Masala. The only two items in this recipe that might be a bit new to you are two wonderfully healthful Indian spices: Garam Masala (which in turn is really just a spice blend of common spices) and Turmeric. But wait, it gets better: you can make it in your slow cooker. If you are like me, this time of the year menu planning can rely heavily on the slow cooker. Here's a new recipe to spice things up and end your slow cooker blahs. In a small bowl, mix the garam masala, salt and turmeric. Set aside. Use 1/2 teaspoon of the spice mixture and add to the flour. Stir well. Pour over the chicken, tossing well to ensure the chicken is fully coated. Add the tablespoon of oil to a large skillet and heat until very warm, but not smoking (use medium high heat). Add the chicken and brown on each side, about 3-4 minutes a side. Add the onion, garlic and ginger and cook for 1-2 minutes. Pour the chicken, onion, garlic and ginger into a slow cooker. Add the tomatoes, peas and remaining spice mixture. Stir to incorporate the spices. Cook on high for 4-6 hours, low 8-10. Once ready to serve, remove the chicken pieces and add the sour cream. Stir well. Add the chicken back into the slow cooker. Serve over rice with cilantro on top (if using). I love birthdays, really, I do. But after a week long celebration full of parties, cakes, house guests, presents and sugar rushes/party highs, I am ready to return to normal mode. Not that I want to wish this special annual tradition away; I actually love it, but you can only be in hyper-birthday mode for so long. SPH and I have a special tradition at the end of Birthday Week each year, one that is sort of wink and a smile type of tradition. At the culmination of the week, we open a bottle of champagne and toast to another year of being parents. We toast to all the moments of "just barely surviving" as well as "really thriving" parenthood memories. The past year was an up and down year, full of vacations, and yet surgeries; new homes, and (ehh, the memory) flooding our old home the eve before our move; and lots and lots of every day memories. This is our annual big birthday week at the Sweet Pea home. Both R and G will celebrate their birthdays in the next week. Be still my heart. 4 and 7? Seems impossible, and yet, in so many ways, perfectly right. No school today, so this morning I broke out the Play-doh (it was in one of the last boxes we unpacked over the holiday break), and the boys are experimenting with some birthday treat ideas. Not a bad way to spend a morning off from school, eh? One last thing--be sure to check out my new take on macaroni and cheese from last week's familyeducation.com post. 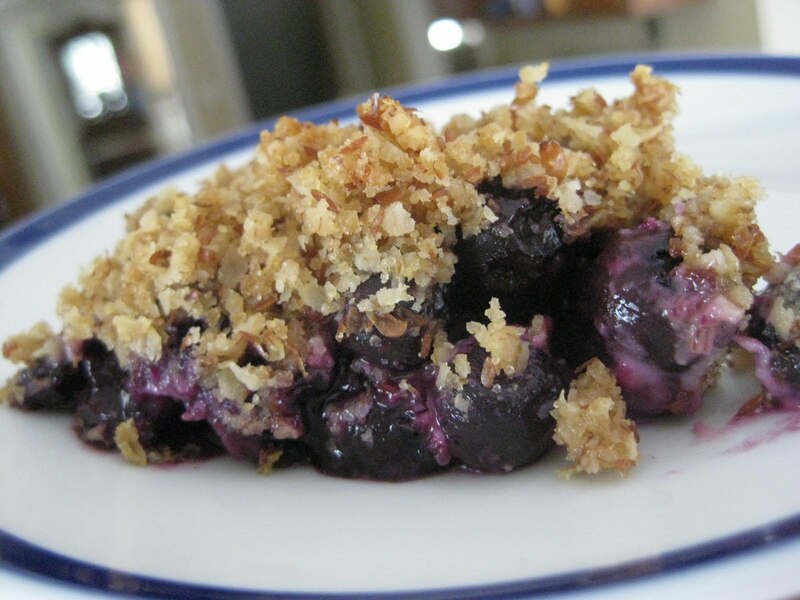 It's a great recipe that has won rave reviews in our home. Every once in awhile we call a dinner an "Adventure Dinner" and try out something new. This past week it was pomegranate. Now, we've had pomegranate before, but not fresh from the whole fruit in a long time. We shared one big pom and I was giddy thinking of all the antioxidants the boys were consuming. Yes, it's the little things. As I type, some of my Southeast Peeps have school off today and gobs of snow/rain. Imagine two little boys up here in Ohio waiting for those same precipitation-filled clouds to move north. They're hoping to go sledding tomorrow afternoon...we will see! Sometimes when I come up with what I believe is a really novel recipe idea, I google it only to find out there are countless renditions already floating around on the internet. So when SPH suggested trying to come up with a warm pasta dinner dish, using enchilada sauce in lieu of a traditional red sauce, with lots of Mexican flavors, I figured there were lots of existing recipes. In my internet searches, I found a handful of cold, picnic/potluck type pasta salads that had Mexican flavors, but no true warm pasta dinner recipes. I took this as a sign to start creating. I love this type of recipe: the base of it, basically the pasta and sauce, can stay the same, but beyond that, the sky is the limit. It can be made with meat, vegetarian or even vegan. In fact, to make this dish I sauteed up a bunch of different vegetables and told the boys to "pick any three:"
And while we used black beans, zucchini, corn, red onions, and tomatoes, you can easily customize this recipe to whatever you have on hand (other suggestions: olives, bell peppers, squash or diced chicken, beef or pork). Meanwhile, in a small bowl, mix the enchilada sauce with 1/4 cup tomato sauce. Taste. Since every brand of enchilada sauce is different, test it's spiciness level to your family's preferences. If you need it milder, tone it down with additional tomato sauce. In a medium skillet over medium high heat, heat the olive oil. Add whatever vegetables you are using for the meal. If you have a less picky family, you can group them all together in the pan to cook at once. However, for our family, I started with the onions, then the beans, and worked my way through the list. As you cook the vegetables, use the cumin, oregano, salt and cayenne to season as you cook. Cook the vegetables until they are tender, about 4-5 minutes. Drain the pasta and pour into a bowl. Pour the enchilada sauce on top and toss well. 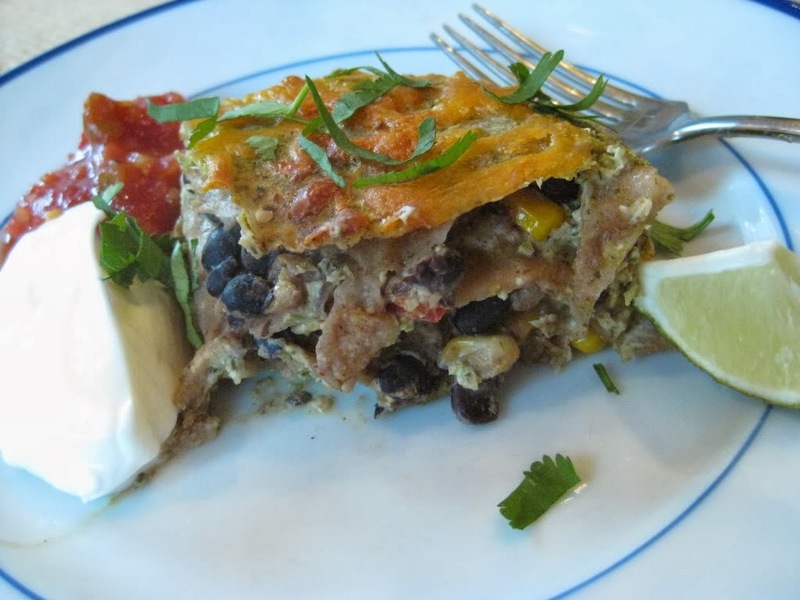 Add the desired vegetables, and top with cilantro and cheese, if desired. I am over at FamilyEducation.com today sharing a new family favorite recipe for Barbecue Chicken Meatloaf. I worked on this recipe over the holiday break and oh-my-goodness, we are hooked. You know how some meatloaf recipes are a bit, hmmm, bland? This is not. You know how sometimes things with the word "barbecue" in it are too spicy for kids? This is not. 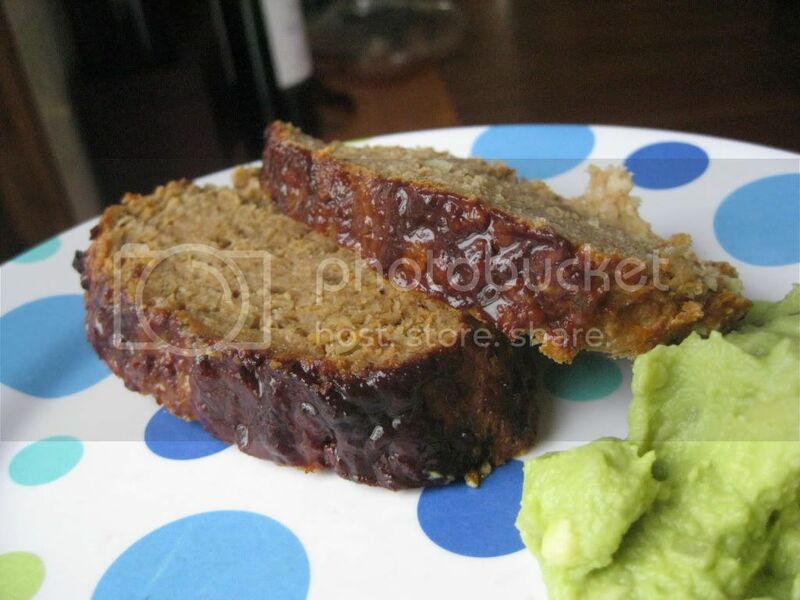 You know how meatloaf can sometimes be a bit greasy and diner-ish? This is not. For all these reasons and more this recipe was a hit! Click here for the recipe link. R and G both returned to school this morning, much to their delight. As wonderful as it was to have all four of us home for the last two weeks of the year, we were all happy to return to our routine today. R to see his friends and get back to 1st grade, G to experience all the messy fun of preschool, SPH to have one extra day off to ease back into work and Yours Truly, a chance to catch my breath between the activity of break and the busy-ness of the weeks to come. And yes, kitchen activity. With SPH home for the break, I had lots of time to get my cooking on, and I am excited to share some new for 2011 recipes. 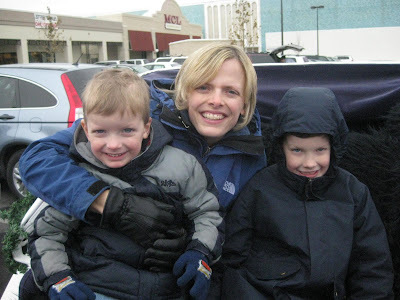 I'll be blogging a lot over on familyeducation.com too, sharing new, healthier renditions of family-favorite recipes. So get ready to get inspired. I'm fired up for the new week and new year--I hope you are too!